Indigenous Peoples in Panama are getting ready for a massive demonstration in resistance to Mining Code reforms and the planned exploitation of the Cerro Colorado mine. The upcoming demonstration in March expected to draw 15,000 Ngobe from all parts of the country. If all goes according to plan, it would be one of the largest indigenous protests in recent history. Given Panama’s current level of rhetoric and their apparent “shoot now ask questions later” policy in dealing with the Ngobe, it may also turn out to be one of the most violent. In preparation for the massive protest, on Feb. 7, more than 2,000 Ngobe mobilized across Panama to protest against the new Mining Code reforms, which were still being debated at the time. “The people demonstrated peacefully, speaking beforehand with the authorities about the intentions of the march,” says the Ngobe Catholic Mission of Soloya, in a press release dated Feb. 10. However, the Ngobe barely had any time to talk before Panama’s police forces opened fire on the Ngobe with tear gas, shot guns and rubber bullets. “In the case of San Felix, the protesters had not even occupied one lane of the Pan American Highway, as was their intention, when they were violently repressed. There was clearly a disproportionate repression of the riot police against the unsuspecting population, resulting in serious incidents of wounded and arrested,” the press release states. Watch how the riot police casually begin to repress the unsuspecting protesters in San Felix. Local authorities later lamented the attack. See this video on YouTube. 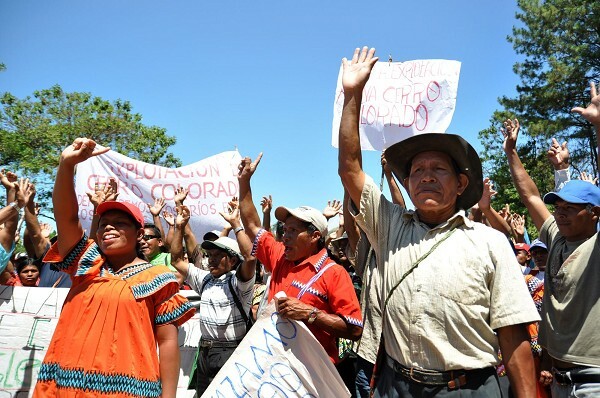 In addition to the mining law, the Ngobe were protesting against the possible exploitation of Cerro Colorado, a huge mountain located within the Ngobe’s territory in western Panama. Government officials claim that the reform wouldn’t threaten Cerro Colorado, which is believed to hold one of the largest copper reserves in the world*. Rather, officials say, the reform is meant to give foreign governments (like Canada, South Korea and Singapore) the right to invest in mining projects. To make matters even worse, some officials appear to be suffering from delusions. For example, on Feb. 9, President Martinelli himself claimed that ‘foreign corporations’ and political groups were behind the protests. Later on, Panama’s Vice President endorsed the preposterous claim. The Ngobe aren’t the only ones protesting, to be sure: they were joined by human rights and environmental groups, workers and university students. However, as Americas Quarterly notes, these protesters, like the Ngobe, were acting on their own, out of a shared concern that new mining operations in Panama would threaten farmland and water supplies. To show your support for the Ngobe, please send a letter to President Martinelli, urging him to revoke Law No. 14 (which criminalizes non-violent acts of protest) and Executive Decree No. 537 (which restricts the right of Indigenous Peoples to choose their own leaders). – The Canadian exploration company Javelin stumbled upon Cerro colorado’s copper reserves in the 1970s. The company was owned by John C. Doyle, the so-called “evil genius” who fled to Panama after being arraigned in Montreal on various charges including fraud and conspiracy involving $4.8m in mining stock. Feb 16 – Ngobe leaders reportedly sent an ultimatum to the government: repeal the mining law or suffer ‘massive and indefinite’ protests from February 24th.